It is nice to have a long weekend off of work. Three days is nice. Four is great. I get to get lots done and still have time to relax and enjoy myself. 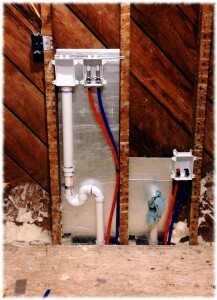 The washer and sink connections plumbed in. Notice the remnants of the foam insulation I added years ago to try to slow down the cold air from that corner of the house. With the wall removed it will be easy to do a proper job of insulating. Yesterday I finished the subfloor and did some cleaning. Today I tackled the plumbing. I roughed in the washing machine and sink drains as well as added the water connections for the sink and drain. The new plumbing is PEX, hooked to a manifold in the basement – but there is no water to the manifold yet. I’ll get the water hooked up this week. But at least the piping is put into the laundry room. The plumbing is (sort of) on an exterior wall. There is an unheated enclosed porch on the other side of the wall, so I will insulate the pipes – Susanna helped me insulate the two pipes going to the sink after the picture was taken. I need more piping insulation for the other pipes – but it is a quick job.